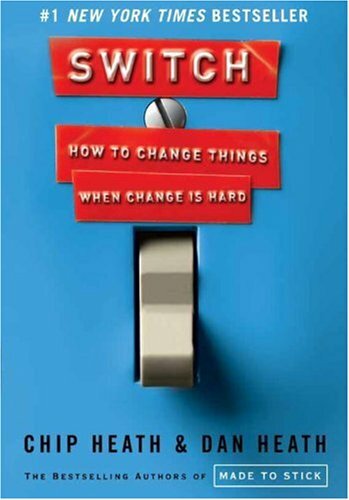 Dan and Chip Heath, authors of Made to Stick, have a new book "to help you change things," Switch. They build off University of Virginia psychologist Jonathan Haidt's The Happiness Hypothesis with an analogy based on an elephant (our emotional side) and the elephant's rider (our rational side). The rider on top tries to direct the elephant, but a 6-ton elephant can go wherever it wants. People may rationally want to change, but their emotions, habits, and instincts may have control. They've filled the book with clear examples (that stick!) and extend the elephant/rider analogy to note that while we can direct the rider and motivate the elephant, we also need to "shape the path" the rider and elephant follow by adjusting situations to provide clarity around the change. This acknowledgment of the need to manage all three factors at once is a demonstration of their systems savvy -- their ability to weave together three separate strands to create a stronger and more effective outcome. I generally talk about systems savvy in terms of technology tools, organization practice, and basic human attributes. Systems savvy is the vision to acknowledge options across each of a situation's technology, organization, and people -- and the wisdom to weave them together into new and powerful outcomes. Switch doesn't speak to the general capability of systems savvy in these terms, but the Heath brothers provide us with many examples of people who are successful at influencing change because they have found a way to do this essential weaving. They provide us with a deeper understanding of how change is perceived and the related human motivations. We're building a powerful library: Switch helps us understand the people strand while the previously reviewed IT Savvy ties together technology and organizational practice. Do you have other suggestions for systems savvy reading?